Some of our tools are stocked and ready to be shipped, therefore you will be able to start working with them very quickly! The EVM provides a quick and easy way to evaluate the functionality and performance of this low power, high resolution, Analog to Digital Converter (ADC). The EVM provides a serial interface header to easily attach to any host microprocessor or TI DSP base system. Evaluation module designed for the prototyping and evaluation of the DAC8411, DAC8311, DAC7311, DAC6311 and DAC5311 digital to analog converters (DAC). These 8 to 16-bit, string DACs operate with a high speed serial clock (up to 50MHz) and offer excellent performance with power consumption as low as 2.5uW. 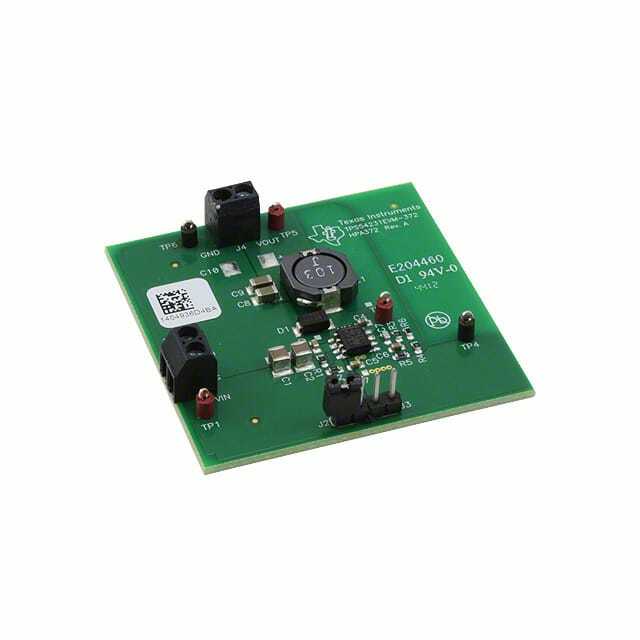 The TPS54231 dc/dc converter is designed to provide up to a 2A output from an input voltage source of 3.5 V to 28 V. This evaluation module is designed to demonstrate the small printed-circuit-board areas that may be achieved when designing with the TPS54231 regulator. The LaunchPad is an easy-to-use flash programmer and debugging tool. It features everything you need to start developing on a MSP430 microcontroller device, with an on-board emulation for programming and debugging and features a 14/20-pin DIP socket, on-board buttons and LETs & BoosterPack-compatible pinouts that support a wide range of plub-in modules for added functionality such as wireless, displays & more. It is a LaunchPad for safety critical applications. It comes with integrated safety features and peripherals such as two 12-bit ADCs, programmable High-End timers, motor control peripherals (eQEP, eCAP, ePWM), USB, Ethernet, MibSPI and serial communication interfaces. Hercules RM series MCUs are designed specifically for IEC 61508 functional safety industrial and medical applications. It also has two standard 40 pin BoosterPack expansion connectors to support peripheral expansion. It is a auto grade lockstep ARM® Cortex®-R4F based MCU with integrated safety features and peripherals such as two 12-bit ADCs, programmable High-End timers, motor control peripherals (eQEP, eCAP, ePWM), MibSPI and serial communication interfaces. Hercules TMS570 series MCUs are designed specifically for ISO 26262 and IEC 61508 functional safety automotive applications. The MSP432P401R LaunchPad enables you to develop high performance applications that benefit from low power operation. It includes a 48MHz ARM Cortex M4F, 95uA/MHz active power and 850nA RTC operation, 14-bit 1MSPS differential SAR ADC and AES256 accelerator. This Launchpad includes EnergyTrace+ Technology, which means you can measure total system energy consumption. All pins make it easy to plug in 20-pin and 40-pin BoosterPacks. The InstaSPIN™-MOTION (and InstaSPIN-FOC) enabled C2000™ Piccolo LaunchPad is an inexpensive evaluation platform designed specifically for motor control. It features 256KB of on board flash, 12bit ADC, I2C, SPI, UART, CAN, dual Encoder support and InstaSPIN libraries in on-chip execute only ROM memory. On-board features such as an integrated isolated XDS100v2 JTAG emulator for easy programming and debugging are included. It works with various BoosterPacks, but is made specifically for the BOOSTXL-DRV8301 (BLDC BoosterPack) in mind. Delfino LaunchPad is a platform that provides designers with a low cost development kit for high performance digital control applications. This powerful microcontroller contains 1MB of on-board flash and includes highly differentiated peripherals such as 16-bit/12-bit ADCs, comparators, 12-bit DACs, delta-sigma sinc filters, HRPWMs, eCAPs, eQEPs, CANs, and more. The LaunchPad supports 12-bit ADC mode through the header pins and 16-bit mode can be driven with external differential signals. MSP-EXP430FR5969 LaunchPad development kit is an easy-to-use Evaluation Module for the MSP430FR5969 microcontroller. It contains everything needed to start developing on MSP430’s ULP FRAM platform, including on-board emulation for programming, debugging and Energy Measurements. The board features on-board buttons and LEDs for quick integration of a simple user interface as well as a SuperCap allowing standalone applications without external power supply. The MSP430FR5969 device features embedded FRAM (Ferroelectric Random Access Memory), a non-volatile memory known for its ultra-low power, high endurance and high speed write access. The MSP-EXP430FR5739 Experimenter supports this new generation of MSP430 microcontroller devices with integrated Ferroelectric Random Access Memory (FRAM). The board is compatible with many TI low-power RF wireless evaluation modules such as the CC2520EMK. The Experimenter Board helps designers quickly learn and develop using the new MSP430FR57xx MCUs, which provide the industry’s lowest overall power consumption, fast data read /write and unbeatable memory endurance. The board can help evaluate and drive development for data logging applications, energy harvesting, wireless sensing, automatic metering infrastructure (AMI) and many others. The Tiva LaunchPad Evaluation Kit is a low-cost evaluation platform for ARM® Cortex™-M4F-based microcontrollers from Texas Instruments. The EK-TM4C123GXL also features programmable user buttons and an RGB LED for custom applications. The stackable headers of the Tiva C Series TM4C123G LaunchPad BoosterPack XL Interface make it easy and simple to expand the functionality of the TM4C123G LaunchPad when interfacing to other peripherals with Texas Instruments' MCU BoosterPacks. The InstaSPIN™-FOC enabled C2000™ Piccolo LaunchPad is an inexpensive evaluation platform designed to help you leap right into the world of sensorless motor control using the InstaSPIN-FOC solution. The LaunchPad is based on the Piccolo TMS320F28027F with unique features such as 64KB of on board flash, 8 PWM channels, eCAP, 12bit ADC, I2C, SPI, UART, and InstaSPIN-FOC in on-chip execute only ROM memory. The LaunchPad includes many board hardware features such as an integrated isolated XDS100v2 JTAG emulator for easy programming and debugging, 40 PCB pins for easy access to the pins of the F28027F processor, reset button and programmable button, etc., Works with various BoosterPacks. These USB Stick Development Tools are a small form factor, very low cost USB-powered DSP development tools which includes all the hardware and software needed to evaluate the industry’s lowest power 16-bit DSP. The new SensorTag is a node that can communicate via Bluetooth or ZigBee®/6LoWPAN technology. It now includes 10 low-power MEMS sensors in a tiny form factor. It is expandable with DevPacks to make it easy to add your own sensors or actuators. The SensorTag is ready to use out of the box with an iOS and Android app. The SensorTag is battery powered, and offers years of battery lifetime from a single coin cell battery. The Bluetooth Smart SensorTag also includes iBeacon technology. The Debugger DevPack debugs your SensorTag with Code Composer Studio and includes a USB power connection, making it easy to power your SensorTag during debugging. Alternatively, simply connect it to a USB power supply if your sensor application requires permanent power. The SimpleLink™ Wi-Fi® CC3200 LaunchPad evaluation kit is a development platform for the CC3200 wireless microcontroller (MCU), the industry’s first single-chip programmable MCU with built-in Wi-Fi connectivity. The board features on-board emulation using FTDI device and includes sensors for a full out-of-the-box experience. This board can be directly connected to a PC using software development platforms including CCS and IAR. This advanced emulation BoosterPack is an accessory for the SimpleLink Wi-Fi® CC3100 BoosterPack. This accessory can be used for; Flashing updates to the CC3100BOOST; Using the CC3100 radio tool for RF performance evaluation; Using Simplelink Studio for CC3100 for MCU software development – PC tool, documents and example applications can be found in the CC3100 software development kit (SDK). The CC1101 is a highly integrated and flexible RF transceiver. The CC1101 is primarily designed for use in low-power applications in the 315, 433, 868 and 915 MHz ISM bands. The CC1190 is a range extender for 850-950 MHz RF transceivers, transmitters, and System-on-Chip devices from Texas Instruments. The eZ430-RF2500 is a complete wireless development tool for the MSP430 and CC2500 that includes all the hardware and software required developing an entire wireless project with the MSP430 in a convenient USB stick. The tool includes a USB-powered emulator to program and debug your application in-system and two 2.4-GHz wireless target boards, featuring the highly integrated MSP430F2274 ultra-low-power MCU. The Educational BoosterPack MKII is a hub of analog and digital inputs/outputs including an analog joystick, environmental and motion sensors, RGB LED, microphone, buzzer, color LCD display, and more. This BoosterPack was developed with Energia in mind. The Texas Instruments Sensor Hub BoosterPack is an add-on board designed to fit the Tiva™ C Series TM4C123G LaunchPad along with all of TI’s MCU LaunchPads. This BoosterPack is a platform for developing product with up to 9-axes of motion tracking and light, infrared and temperature sensors. The BOOST-DRV8711 is a 8-52V, 4.5A, bipolar stepper motor drive stage. The module contains everything needed to drive many different kinds of bipolar stepper motors and can also be repurposed as a dual brushed DC motor driver. This kit was designed to be compatible with all TI LaunchPads following the LaunchPad Pinout Standard, with primary software/firmware support being provided for the MSP-EXP430G2 LaunchPad with a MSP430G2553. The BOOSTXL-DRV8301 is 10A, 3-phase brushless DC drive. The module has 3x low side current sense amps (2 internal to DRV8301, 1 external). The module also has a 1.5A step down buck converter, is fully protected with short circuit, thermal, and shoot-through protection; and is easily configured via an SPI interface. This kit was designed to work with any LaunchPad XL, with primary software support through the http://www.ti.com/tool/LAUNCHXL-F28027F using MotorWare to support the InstaSPIN™-FOC sensorless control solution. The Audio Capacitive Touch BoosterPack is a plug in board for the MSP430. The kit offers a complete reference design for capacitive touch solutions, using the capacitive touch I/O ports of select MSP430 Value Line microcontrollers. This reference design allows designers to easily control the C5000 ultra-low-power DSP using TI’s MSP430 microcontroller for crystal clear playback and record of MP3 audio/voice files. The CC110L RF BoosterPack is a low-power wireless transceiver extension kit for use with the Texas Instruments MSP-EXP430G2 LaunchPad development kit. Based on the CC110L device, the on-board Anaren Integrated Radio (AIR) A110LR09A radio module with integrated antenna operates in the European 868-870MHz band. The Capacitive Touch BoosterPack is a plug in board for the MSP430. 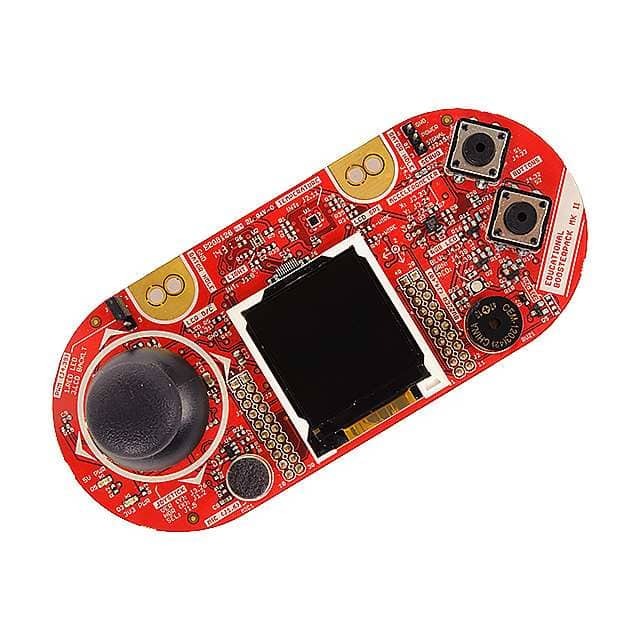 This BoosterPack features several capacitive touch elements including a scroll wheel, button and proximity sensor. Also, on- board are 9 LEDs that provide instant feedback as users interact with the capacitive touch elements. This BoosterPack kit contains one "EM Adapter BoosterPack". The purpose of the EM adapter board is to provide an-easy-to-use bridge between any of the TI MCU LaunchPads and the vide variety of TI RF evaluation modules (EM), for instance the CCxxxx Low-Power RF evaluation modules. The C2000 LED BoosterPack demonstrates the control of 3 boost converters to drive 3 LED (Red, Green, and Blue) strings. A variety of user interface options are provided included capacitive touch control using an MSP430 and the MSP430 Cap Touch as well as a PC GUI application. This BoosterPack is ideal for real time digital control techniques and LED lighting. It demonstrates the use of inductive sensing technology to sense and measure the presence, position or composition of a conductive target object. The module includes an example of a PCB sensor coil. An MSP430 microcontroller is used to interface the LDC to a host computer. It is a plug and play system to test and evaluate the HDC1000 humidity and temperature sensor. The EVM is a breakable PCB which consists of 3 sections. The first section is a USB to I2C converter based on MSP430F5528 microcontroller, the second section is a conversion board (WCSP to SIL 100mil pitch) with the HDC1000 and the third section is a narrow 5mm x 5,5mm pcb with the HDC1000 (WCSP to SIL 50mil pitch) which allows to reduce the thermal mass of the system (sensor + pcb). Both second and third section can be used for remote measurements. The HDC1000EVM does not need additional hardware, calibration nor does it require any software programming - only the HDC1000EVM GUI has to be installed. The TMP75B is is a digital output temperature sensor capable of reading temperatures of -40ºC to +125ºC with 12 bits (0.0625 C) of resolution. The TMP75B uses a two-wire I2C protocol SMBus interface that allows up to eight devices on one bus. It is ideal for extended temperature measurement in communication, computer, and consumer, environmental, industrial, and instrumental applications. There are several software tools that could be useful in your project. You can download software (limited versions) for free from the TI website. Just follow the links by clicking on the software name. Integrated development environment for Texas embedded processor families. CCStudio comprises a suite of tools used to develop and debug embedded applications. Please use time-limited or code-limited license. IYou can use WEBENCH to create customized power supplies or DC-DC converters for your circuits. This environment gives you end-to-end power supply designs and prototyping tools. These tools provide complete sensor circuit design for common sensing, transmitter, and transducer applications. You can start with an industry standard sensor or specify your own sensor requirements to create your own custom sensor. WEBENCH sensor tools provide you with optimized signal path performance, bill of materials, budgetary cost, and links to evaluation boards and other tools for testing and validating your simulated solution. The WEBENCH Filter Designer lets you design, optimize, and simulate complete multi-stage active filter solutions within minutes. Create optimized filter designs using a selection of TI operational amplifiers and passive components from TI's vendor partners. Can be used to evaluate and configure Low Power RF-ICs from Texas Instruments. The application will help designers of RF systems to easily evaluate the RF-ICs at an early stage in the design process. The Tiva C Series PinMux Utility allows a Tiva C Series MCU developer to graphically configure the device peripherals intuitively and rapidly. This tool provides an easy-to-use interface that makes setting up alternate functions for GPIOs easy and error-free. Collection of code examples, datasheets and other design resources for ALL MSP430 devices delivered in a convenient package - essentially everything developers need to become MSP430 experts! Cohesive set of software infrastructure and software tools designed to minimize software development time. From device-specific drivers and support software to complete system examples and technical training, controlSUITE™ provides libraries, examples, and support at every stage of development and evaluation. TivaWare software for C Series is an extensive suite of software tools designed to simplify and speed development of Tiva C Series-based MCU applications. All TivaWare for C Series software has a free license, and allows royalty-free use so users can create and build full-function, easy-to-maintain code. The SimpleLink™ Wi-Fi® Starter mobile App is a convenient tool for users to configure, connect, and communicate to the CC3100 BoosterPack or the CC3200 LaunchPad. This application uses TI SmartConfig™ Technology to easily provision CC3100 and CC3200 devices. The app helps users find SimpleLink Wi-Fi devices connected to the network using the mDNS function under Devices tab. Now talking to your Wi-Fi device is simple. The SimpleLink™ Wi-Fi® CC3200 SDK contains drivers for the CC3200 programmable MCU, 40+ sample applications, and documentation needed to use the solution. It also contains the flash programmer, a command line tool for flashing software, configuring network and software parameters (SSID, access point channel, network profile, etc. ), system files, and user files (certificates, web pages, etc). Easy-to-use, powerful circuit simulation tool based on a SPICE engine. TINA-TI is a fully functional version of TINA, loaded with a library of TI macromodels plus passive and active models. What stands for a “TOOL”? A tool is considered as a board (e.g. Evaluation Module, Development Kit…). These are the parts that can be ordered to participate in the contest and up to an amount of 100$. What stands for an “IC”? ICs are chips, silicon (e.g. to be soldered on a PCB). These ones cannot be ordered as part of the 100$ budget, you will need to request them directly through the TI’s website and pay for them. The team leader must login to the tool request page on the TIIC Europe Portal and submit the teams’ tool request online. The tool/boards request must be $100 or less and must only include tools. You cannot order more than 5 units of the same development tool. ICs are not allowed to be ordered and will not be accepted as part of the tool request. Tool requests must be made before the deadline: 23:59 (GMT) on 30th April 2016. We advise you to firstly check the Recommended Tools list, also available on the tool request page of the TIIC Europe Portal for the most popular tools. If the tool you want is not on the list, use the Freeform and fill in the part number, website hyperlink and price. No PO Box Addresses will be accepted in the shipping address. Do not order samples this way. http://www.ti.com/tool/... - This is a valid tool page. http://www.ti.com/product/... - This is not a valid tool page. Requests from such pages will be rejected. TI ships tools from its European (EU) warehouse. This means that for non-EU participants, shipments of tools could be subject to local import duties (such as VAT) and customs clearance charges on arrival in your country. These charges are your responsibility. They will not be paid by TI under any circumstances. What can you do to avoid import charges? Use your professor and your University as the shipping address, rather than your home or lodging address. Purchasing the tools you need from a Local Distributor in your country may be easier for some items and avoids all import charges (We do not give teams cash. You will have to pay for the tools yourself). We encourage you to have a discussion with your professor.